First, sorry for the late posting. I had a little hiccup in my scheduled post, for some reason it didn't change from a draft. So, hopefully all is well now. Ok, I had to change my card too, because I didn't follow the recipe! I'm an Arkansan. We wear jeans all the time... work, church, play, even weddings. You name it, we can make the denim work. 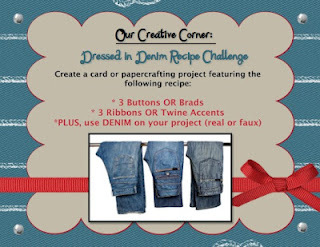 So dress it up or dress it down but use 3 ribbons or twine, 3 buttons or brads, and some denim on a project. I used some pretty pattern papers from Teresa Collins. I have to admit, that I just love her designs. She makes some very pretty pattern papers and embellishments. I found this denim ruffled ribbon at a local shop and thought how pretty! I used some seam binding, a bit of baker's twine and a scrap piece of stitched ribbon. I used a favorite buttons: Paper Trey Ink Vintage. Love 'em! I wanted a blossom of some kind, but couldn't get anything to look appropriate, so I punched some floral shapes from pattern papers and used two white brads to hold them together. I also used a die to cut some white leaves to complete the blossoms. I used one of my 'go to' label stamps: Four Frames by Stampin' Up! The sentiment is from another stamp set. You know me; mix, match, and the kitchen sink! I hope that you get a chance to play along with us this week. Add some denim to your paper craft item, along with 3 ribbons/twine and 3 buttons/brads, and you never know, you could be our next Top Talent! over @ Our Creative Corner! Gosh they are pretty papers too! The ruffled Denim could not have been easy, but you have made a superb job, it looks wonderful. One would not have thought that Yellow would sit so well with this hue of Blue but it so works. There just isnt enough yellow in the world, is there. I always love to see a yellow card and I dont make enough of them myself. Your card is just adorable. How can you not have a happy life with a card like this in your hands?!? 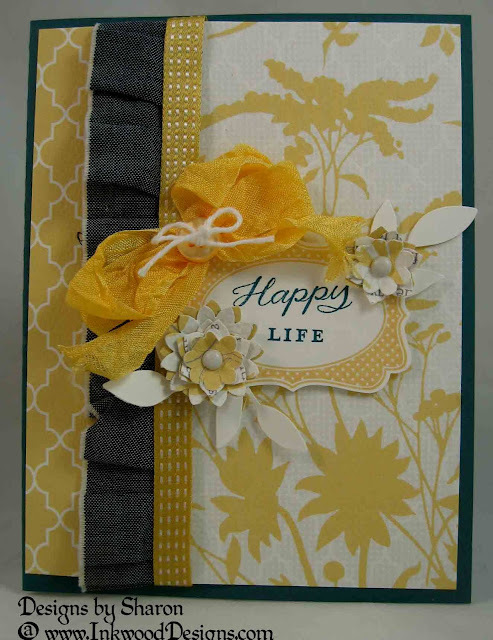 Sharon, if I wasn't smiling before, I am now..you've brought comfort and sunshine and relaxation and all things gorgeous together in this card. Nicely done! Beautiful Sharon! Love the dark yellow with this denim! What a fab card to receive!